The State-of-the-Art Dean of Education needs to be able to articulate a vision (plan) for educational innovation in order to move the school from "good to great" (Collins, 2001); however, the dean needs to involve the whole school community in this, first, so that the plan can really be exhaustive and accurate; second, so that the constituents of the school take ownership of the plan and proactively participate in its implementation. How does the State-of-the-Art Dean need to proceed? 1- The dean needs to exhibit the characteristics of a "level 5 leader" (Collins, 2001) who enjoys personal humility and professional will; who leads with questions, not answers; who engages in dialog and debate, not coercion. 2- The dean needs to establish a steering committee under his/her leadership, and each person on this committee should be the right person in the right seat. It is not about you: it is about the mission. Learning from the Past: What is working well within our system? What is not working well and why? Thinking about the future: What parts of the system need to be enhanced? What enhancements are the higher priorities? What parts need to be changed/modified in some way? What new ideas or approaches to crisis services would you like to see considered? 'Where are we at? Where do we want to go?' are key questions. The survey can be a four-question one that asks people to comment on the strengths and weaknesses of the school of education, what critical issues face the school and what opportunities the school has for addressing them. 5- The committee needs to develop a strategic plan (with strategic goals and measurable objectives) for addressing the school's strengths, weaknesses, opportunities, and threats. 6- The committee needs to set a tentative due date with different stages for completing the plan. 7- The committee needs to assess the results of the plan after a previously defined period of time. 8- The committee needs to close the loop and make the necessary changes. 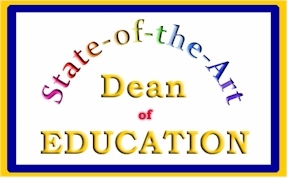 The dean of the school of education has a responsibility that other deans at the university do not have: it is to strive to get all doctoral programs at the university level (not only at the school of education level) to include in their curricula at least one course about goals objectives, assessment (including devising rubrics), and teaching strategies. Doctoral programs (in business, engineering, medicine, sciences...) might produce teachers/instructors, and it would be a shame if those teachers/instructors took up teaching at school or university level without having taken at least one education course. Setting broad course goals, writing specific and measurable objectives, following sound and effective assessment techniques, and implementing appropriate teaching strategies that accommodate all learning styles are skills that every teacher/instructor needs to have. We all know that very few schools besides the school of education do teach those skills, but all schools at the doctoral level produce teachers. Therefore, it is a must for the dean of the school of education to strive to get ALL schools at university to include this education course at the doctoral level. The State-of-the-Art Dean of Education needs to develop, implement, and assess high quality academic programs and their effectiveness; the dean needs to show oversight in planning curriculums and instruction. The changes in society, the current trends, the needs, and the futures of society are what the dean needs to keep in mind when developing, implementing, and assessing academic programs. Conventional Instruction, Computer Mediated Communication, Educational Technology, Educational Trends, Technological Advancement, and job markets are some aspects that need to be studied. Mission statement, goals, objectives and assessment methods are all very important for the success of the school of education. The dean needs to make sure that they follow the vision the dean has for the school and for each department within the school. mentorship programs are created for new faculty, staff, and struggling students, hereby setting an atmosphere of help, collaboration, and love... and a belief in "All for One, and One for All!" Be the Leader. Produce Leaders. Organize Teams that Work!